[May, 2004] I opend a bottle and finished it August, 2006. I bought it for 63 Euro in May, 2004.
committee, hence the `For Discussion...` branding. For me this one is clerly the best of all these Very young - Renaissance releases. It`s not as herbal in style as the 1998 and later distillates. 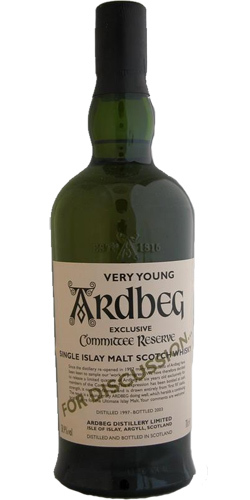 This is the only 97 Ardbeg I tasted yet and I think it`s much closer in style to the Ardbegs from the old times then what theay produced later. But it`s definitely what it`s called: Very young. and 60s. Fresh sea air and shellfish too. Salt and spice, salt and spice, but then the youth of the dram breaks out with Ardbeg new-make notes all over the place. Endlessly sizzling on the tongue like salty sherbet.